The Webster University Alumni Association is pleased to announce its 2018 Pioneer Award recipient, Marian Dooling McIntyre. The Pioneer Award honors Webster alumnae who laid the foundation for Gorlok Athletics. McIntyre was recognized for her contributions to Webster Athletics and the field of physical education at the Athletics Hall of Fame Induction Ceremony on Feb. 10. 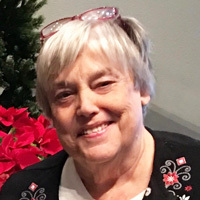 McIntyre, a Webster Groves-native, who attended Holy Redeemer Grade School and Nerinx Hall High School, began her education at Webster College in 1957. She was an active student, playing both basketball and volleyball all four years of her college career and serving as President of the Athletic Association. As Webster did not host a field hockey team, Marian played the sport with other college students in Forest Park as part of the Field Hockey Association in St. Louis. She graduated in 1961 with a degree in physical education. After graduation, McIntyre began her teaching career at St. Joseph’s Academy, where she taught physical education and health, and coached the field hockey, basketball, volleyball, tennis, and track and field teams. At the time, the all-girls’ high school athletics program was not part of the Missouri State High School Activities Association, so McIntyre served on a committee to advocate for female high school athletics to receive the same recognition as its male counterpart. 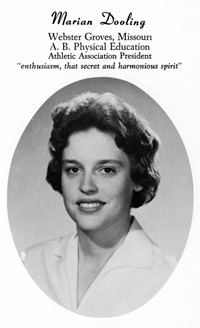 A passionate educator, McIntyre continued to teach at several schools in the mid-west, including John Hersey High School in Arlington Heights, Illinois, where she developed an adaptive physical education class for girls with special needs and served on a committee of women who worked to allow girls athletic programs to be recognized by the Illinois High School Association. McIntyre also assisted in opening a preschool at St. Mark the Evangelist Catholic Church in San Antonio, Texas, which, after 35 years, continues to provide a nurturing, caring and positive atmosphere for children to learn. After returning to the St. Louis area in 1984, McIntyre became a substitute teacher for Kindergarten and eventually made her way back to her very own grade school to teach second grade at Holy Redeemer. She continued to teach in the Catholic school system until her retirement in 2006. Despite her busy teaching career, Marian still found time to coach her son’s fifth-grade basketball team and instilled a life-long love of sports among her children and grandchildren. In the fall of 2006, McIntyre was hired to teach child stars Alyson Stoner, Parker McKenna Posey and Dylan McLaughlin on the set of “Alice Upside Down,” which was filmed in St. Louis. She also volunteered as a St. Louis Cardinals Tour Guide and, along with a group of fellow retirees, wrote the Cardinals Academic Program (CAP), an education program for children in grades 3-8. The program continues to be offered during the off-season as a field trip opportunity for schools in Missouri and Illinois. As a Webster volunteer, McIntyre has served as a class chair for her reunions and as chair of the Liaison Committee, where she worked tirelessly to bridge the gap between the Gorloks of today and the teachings and spirit of the founding Sisters of Loretto. The Pioneer Award was created in 2015 to celebrate Webster University’s centennial milestone and honor Webster alumnae who laid the foundation for Gorlok Athletics.